The President of the United Labour Congress (ULC), Joe Ajaero, says organised labour would not accept government's plan to increase the Value Added Tax (VAT) to pay the N30,000 new minimum wage. Mr Ajaero spoke on Wednesday to the News Agency of Nigeria (NAN) in Lagos in reaction to the Federal Government's indication that it might increase VAT to enable it to pay the minimum wage. 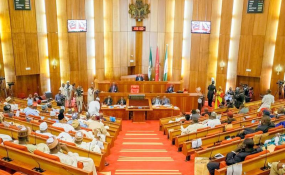 The National Assembly on Tuesday passed N30, 000 as the new minimum wage for workers; two months after the House of Representatives first approved the same. The Minister of Budget and Planning, Udo Udoma, at a meeting in Abuja, said that VAT could be raised to 50 per cent before the end of 2019 to enable the government fund the new wage. But the ULC president said there was no condition attached to the increase in salaries for workers during the tripartite negotiation. He said if the government was contemplating an increase in VAT to fund the new minimum wage, it should be discussed with stakeholders. "There was no condition attached during minimum wage negotiation. If there will be an increase in VAT, all stakeholders will look at it and take a decision," the labour leader said. He commended the Senate for quick approval but said that President Muhammadu Buhari should not delay in signing the bill for it to be implemented. TUC President, Bobboi Kaigama, in a statement, said the new wage would in no small measure give the workers a sense of belonging. Mr Kaigama said it was regrettable that inflation has affected the purchasing power of the new wage, as prices of commodities had risen even when employers have not commenced payment.